When it comes to long-range optics, some folks can’t have too much magnification. 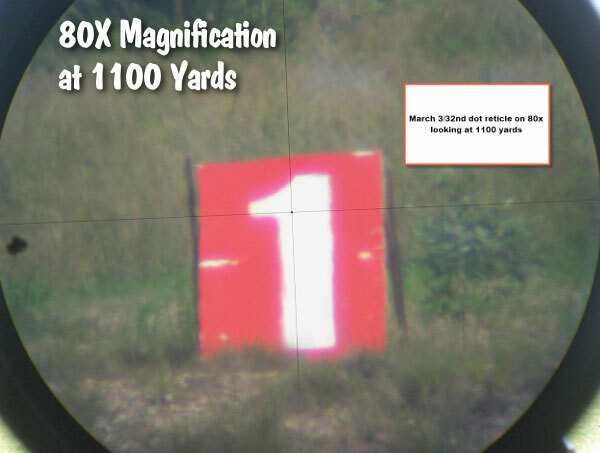 At 500 yards and beyond, when the air’s misty or the mirage is thick, you can’t always use extreme magnification. But, when the conditions are excellent, it’s nice to have 50X magnification (or more) on tap. You can always “crank it back down”. 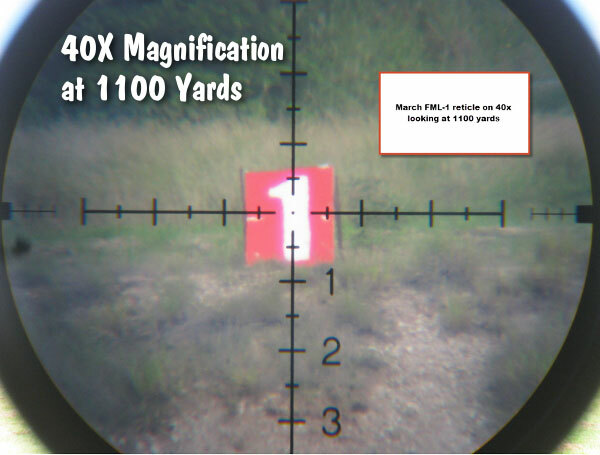 Higher magnification (when conditions are good), can help you see your bullet holes at long range, and that makes it easier to judge your hold-offs and keep your group centered. In addition, there’s no doubt that high magnification lets you aim more precisely, no matter what the distance. Even at 100 and 200 yards, short-range benchresters are using 40X, 50X, and even 60X power scopes. This allows you to position your cross-hairs with extreme precision — something you need when you’re trying to put multiple shots through the same hole. How much power is usable? A few years back, folks said you can’t use more than 45X or so at long range. Well, as modern optics have evolved, now guys are buying scopes with even more magnification — way more. 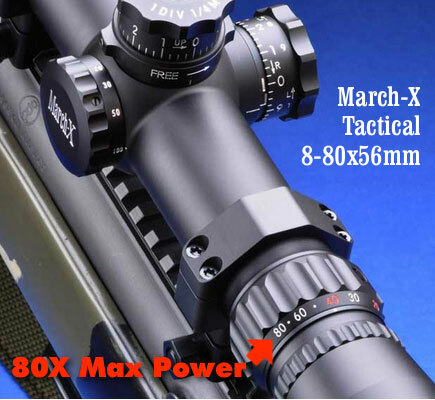 There are practical limits of course — with a 56 to 60mm front objective, the exit pupil of a 60X or higher-power scope will be very tiny, making head orientation ultra-critical. Any many scopes get darker as you bump up the magnification. 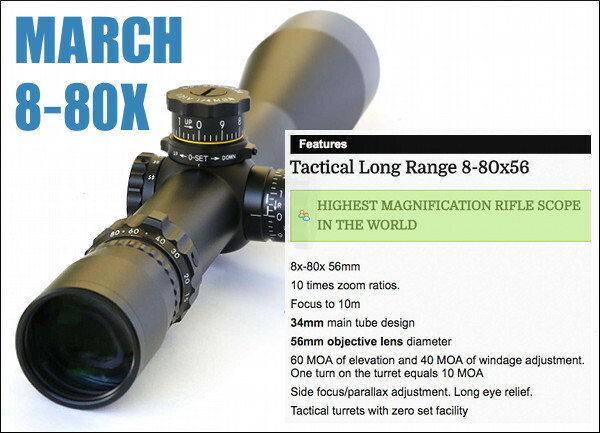 Share the post "World’s Highest Magnification Rifle Scope: March 8-80x56mm"
10-times zoom ratio is killing those scopes and optical clearity. Great, but what is it’s Elevation capability? Probably way less than needed for the 1200 to 3500 yd shooting my friends and I do. I also agree with Mark, 10X is not needed and making the optics worse. 16-80 power would be fine! 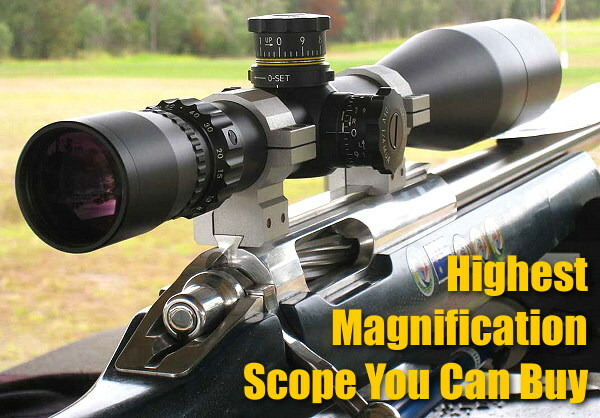 A brilliant scope – I could see 6.5mm holes on a 1000 yard target in the right conditions. Be able to use the 1 inch patches on the holes let me aim off and shoot a 2 inch group. But this is a specialist tool for specialised shooting – and not for everyone. If you know what you are doing and what to see what other people cannot – these are the scopes to take a good hard look at. But you have to train your brain and that doesn’t come instantly. The price is $3,600. Haven’t looked through one, but at that price point, it should be pretty good stuff. Introduced late 2010. Not sure why we have this promotion – but do a google for the global March dealership.